After a 9-year hiatus, the biggest indoor metal festival in Eastern Europe - Metalmania, comes back to life. The 23rd edition of this iconic festival will be held on April, 22nd 2017 in Spodek Hall, Katowice (Poland). Apart from seeing your favourite bands performing on the stage, you will also have a chance to stand face-to-face with them during special signing sessions. The bands will be more than happy to sign your CDs, shirts, body parts etc. 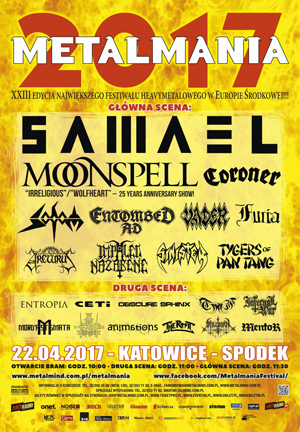 Metalmania Festival - one of the most important musical events of 2017, a real treat for metal maniacs! Metalmania remains true to its formula - one day, two stages, over 20 bands from all around the world and thousands of fans! That’s what Metalmania Festival is all about!